Explore the many layers of natural wonder with this set of layered glassware. 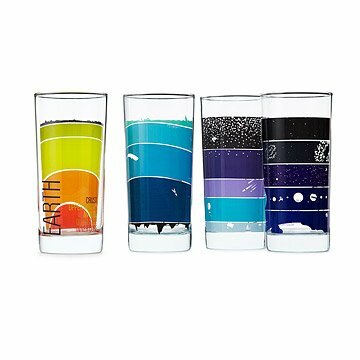 Explore the many layers of natural wonder with this earthly set of glasses, showcasing the beautiful sections of our universe—from the earth’s ocean to the core, and from the atmosphere into the intergalactic reaches of space. Each layer is labeled so you can get your science lesson alongside your morning juice. Glasses feature ocean, earth, atmosphere, and space. Glassware made in New Jersey, decorated in West Chicago, Illinois. If you like these glasses, check out our Stacking Cups. Visit our blog to read our interview with Jason and Briana. Dishwasher safe. Do not stack glasses. These glases are awesome. Constantly get compliments and asked where I found them. Can not wait for them to be back in stock to get another set!!!! I bought these as an anniversary gift for my husband and he absolutely loved them. We use them as everyday glasses because of the size and shape. The little details on the glasses are great too, I love the whale and giant squid on the ocean glass. I had been looking for some fun or interesting water glasses for quite a while, after breaking most of my current favorites. :-( Nothing I found online was quiet right until I found this set of earth science glasses. Being a science, and especially space nerd, these are perfect. I ordered two sets of four. The design is contemporary and interesting. The colors are tasteful as well as matching each category(earth, ocean, atmosphere, and space). I love using them myself and enjoy serving beverages in them to my guests. Very unique set of drinking glasses. Perfect wedding gift for my good friend who is an Earth Science teacher. Her husband (not an E.S. teacher) also loved them. Educational, functional, a definite conversation starter. Wanted a special gift for an Earth Science teacher. This was absolutely perfect! Love the style and detail. I got this gift for a friend who would be graduating soon, and figured that when he had his own place, he'll have some cups to use. He loves the design on them! Aside from the design, it also teaches a little bit about geological science, astronomical science, atmospheric science, and oceanic science. I wish there were more of these kinds of products! I regret reviewing these glasses negatively. They're beautiful, and aesthetically pleasing to hold and drink out of but they are VERY breakable. My fiancÃ© and I enjoy them so much we are considering ordering the matching prints and we will probably do so when we redecorate but we're going to wait to reorder the glasses in order to see if the artists use a different manufacturer. We wash our dishes by hand and two have broken in the sink (without being dropped). These glasses are not suitable for everyday use! That being said, they're beautiful and we're probably going to reorder a second set eventually because we like them so much but keep this in mind, if you order them...they are VERY breakable! Lastly, uncommongoods.com was wonderful in terms of shipping/customer service/etc.. We also contacted the artists directed about replacing the first broken glass and they regretfully informed us we could not buy single glasses but they were also great to deal with and spoke highly of working with uncommongoods.com. But beware...these are not everyday drinking glasses; they can break by merely being tipped over. These glasses are really cool, and look really good in our bar display case! These are great! I really have no complaints other than that I wish they'd add more to the set. Eight would be unstoppable.